Do you want to make great money and guaranteed income with no effort or work? Do you own property on a major highway or interstate that is heavily traveled? If so, Summit Outdoor Advertising would like to talk with you about a profitable, enjoyable, win-win relationship that could provide you with significant income for years to follow. Receiving guaranteed payments on a monthly, semi-annual, or annual basis. Summit Outdoor can structure a deal that pays you as the land owner a great income for decades to follow. We pay guaranteed land lease payments to you for allowing us to have a small pole in your ground about the size of a car's tire. Having a Summit Outdoor billboard on your property not only increases its value now, but significantly at the time of its sale or in the event of condemnation by a government agency. Those future payments are worth big money to the next owner and you can justify a sharp increase in the sales price or sale your land and keep the monthly payments yourself. Increases your ability to borrow money. Your land now generates income and that increases your ability to borrow additional money for improvements and other things you may want or need. There are two different ways we can structure the compensation to you. 1. Land Lease - Receive payments monthly, semi-annually, or annually, year after year for the term of the lease. Some land owners like the residual long term income and the peace of mind it offers. 2. Easement Purchase - Receive a one time, much larger lump sum payment when the billboard is first installed. Some land owners like getting it all up front to have a significant sum of money to make large purchases or invest for the future. Please take a look at the Frequently Asked Questions section that will give you more specific information about a billboard on your property. If you think you may desire all the benefits of having an income producing Summit Outdoor billboard on your property, take the next step and contact us. 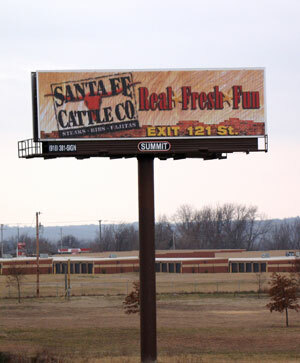 We will promptly evaluate your property to see if it qualifies for an outdoor advertising structure. If it does, then we can get you the specifics you need and start the process moving forward. To speak with a Summit Outdoor Advertising representative, please email us at info@summitoutdoor.com or call (918) 381-SIGN (7446).